Bertha Arndt, age 100, of Aurora, passed away Tuesday, November 7, 2017, at Memorial Hospital. Funeral Services will be held 10:30 A.M., Monday, November 13th at the First Evangelical Lutheran Church in Aurora. Pastor Wayne Oblender will officiate. Interment will be in the Aurora Cemetery. Visitation will be from 5 - 7P.M. Sunday at Higby-McQuiston Mortuary. Memorials may be made in care of the family to designate at a later date. Condolences may be e-mailed to the family through the mortuary website at www.higbymortuary.com. 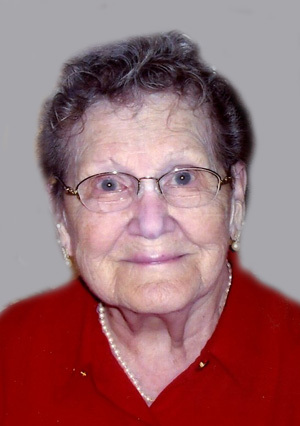 Bertha Marie Arndt, the daughter of John and Rosina (Wagner) Schaffert, was born south of Aurora, Nebraska on the family farm on June 26, 1917 and passed away in Aurora, Nebraska on November 7, 2017, at the age of 100. She grew up south of Aurora, where she helped her parents on the farm. Bertha attended school through the 12th grade. Bertha was baptized and confirmed in the Lutheran faith. On March 24, 1940, she was united in marriage to Herman F. Arndt at the Salem Lutheran Church near Hampton. Three children were born to them. They farmed near Hampton, until 1945, when they moved to a farm south of Aurora, where they farmed until their retirement in 1966, when they moved into Aurora. Bertha worked as a cook for the Aurora School District and later at Memorial Hospital. Herman passed away on July 31, 1984. Bertha was a member of the First Evangelical Lutheran Church, Ladies Aid and Lutheran Women’s Missionary Society. She enjoyed helping her children, watching her grandchildren’s activities, playing bridge and pitch, putting puzzles together and doing things with her East Park Villa Family. She was preceded in death by her parents; husband and six brothers. Those left to cherish her memory are her three children, Ardean (Eloise) Arndt of Lincoln, Mary Ann (Larry) Schwarz of Archer and Bill (Nancy) Arndt of Aurora; 11 grandchildren and 21 great-grandchildren. She is also survived by many nieces, nephews, great nieces and nephews and other relatives and many close friends.